How do you build your dream home and make it appear as if it has been part of the landscape for years? 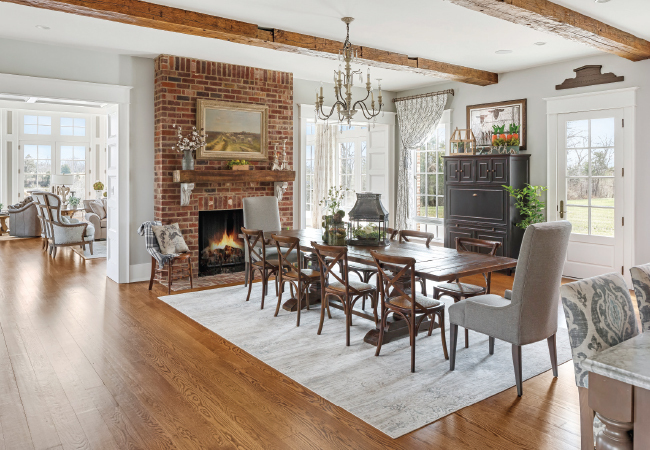 For the owners of this gorgeous Mount Washington farmhouse, the secret was finding the right team to bring their vision of local tradition to life. Story by Allison Jones • Photos by Tim Furlong, Jr. 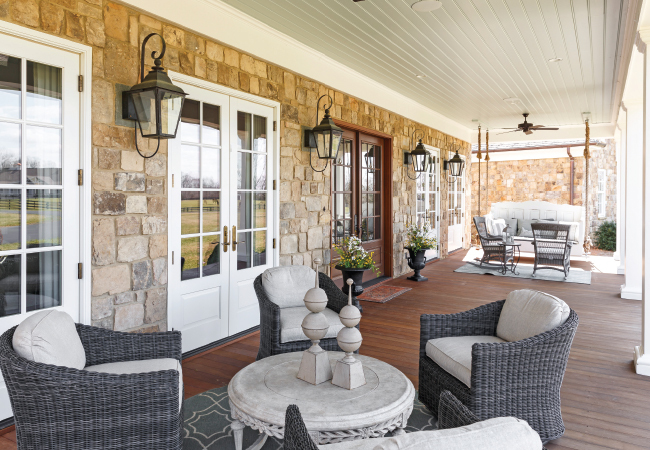 Situated rather majestically on the crest of a hill overlooking sprawling farmland, this gracious farmhouse fits the landscape so perfectly that it seems as if it has sat there for years. However, this light-filled oasis (positioned to capture ambient light from sunrise to sunset) is a custom-built masterpiece completed in 2017 and surrounded by 270 acres of lush green space that includes another family home, stables, gardens, a lake, a slew of farm animals, and a host of other amenities. It’s the homeowners’ very own, perfectly designed and carefully cultivated private corner of the world. 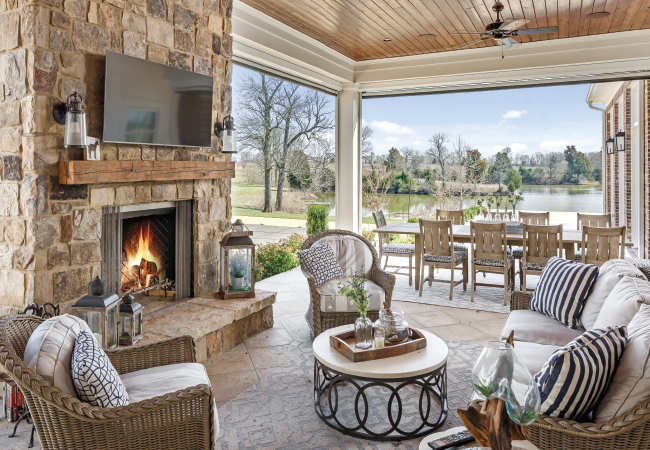 The dream team behind this idyllic dwelling included builder Mike Blacketer of The Blacketer Company and interior designer Karista Hannah of Set the Stage. 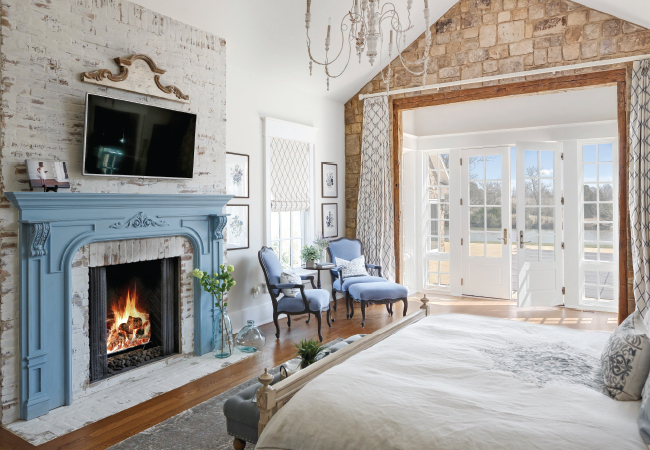 Together they created a modern version of a traditional farmhouse that exudes warmth and comfort. The home is understated, but somehow still delivers an overwhelming wow factor. From the bourbon-themed bar in the lower level to the great room framed with windows, this is a place created for family. “The library is so warm and cozy,” Karista shares. 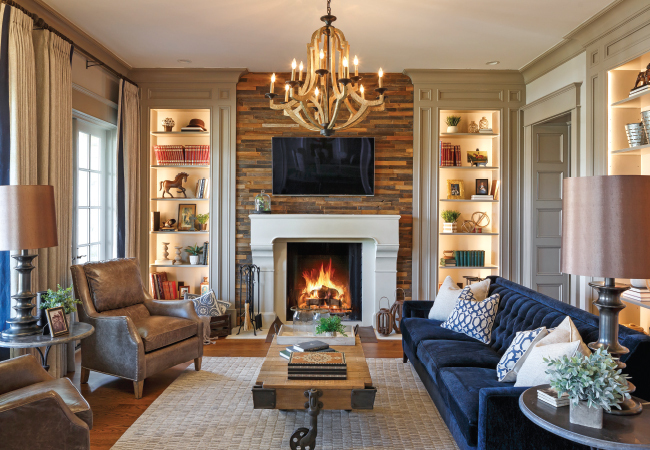 Three-dimensional wood tile accentuates a fireplace flanked by built-in bookcases. The room features a pair of leather club chairs that accompany a tufted sofa. Karista added lighting in the bookcases to highlight collectibles and family photographs. It’s the ideal spot to unwind all together in front of the television or curled up in the corner with a book. Rustic wood beams are a focal point in the kitchen and breakfast room combination. An expansive island—one of the largest Karista has ever done—is cloaked in quartz. Upholstered bar chairs embrace the island with stylish chandeliers adding an element of drama. 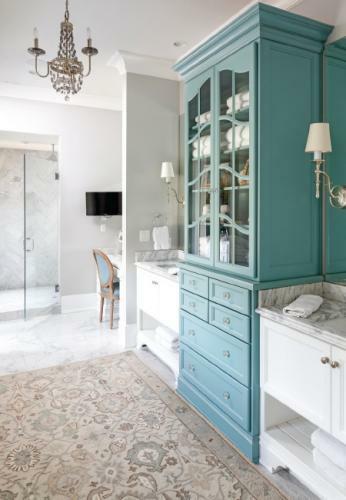 The pantry door, along with the buffet that was creatively turned in to a coffee bar, were family heirlooms that add sentimentality and character to the room. Vintage shelves above the coffee bar corral a variety of family collectibles. 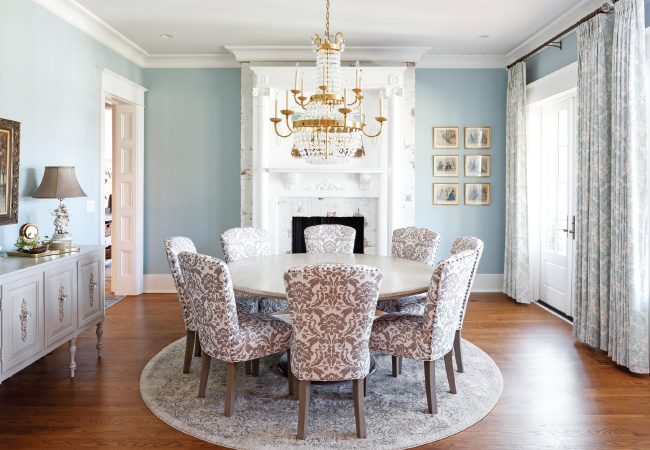 Host or hostess chairs are paired with x-back chairs that surround a large farmhouse table that welcomes family gatherings. The homeowners wanted to recreate a bar from a local downtown restaurant for their lower level. 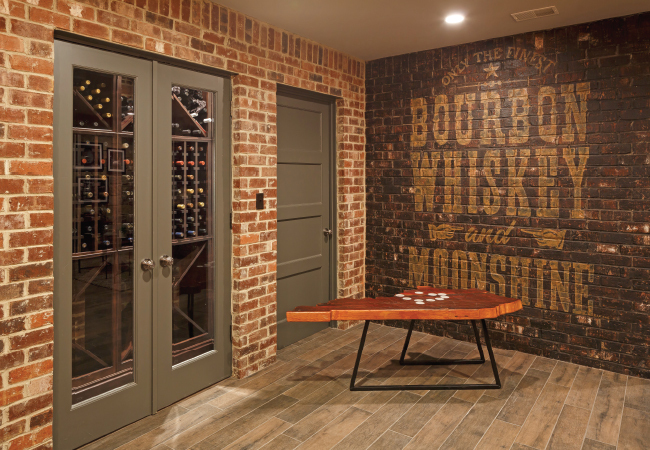 A hand-painted mural greets guests, while elements of brick and stone add texture. Wood shelves behind the bar showcase personal collectibles and flank an Elijah Craig bourbon barrel top. Black and white photos decorate the stone walls, while staggered seating invites conversation. The vibe is comfortable and inviting. The house was built to create family memories and it is easy to imagine that it will. 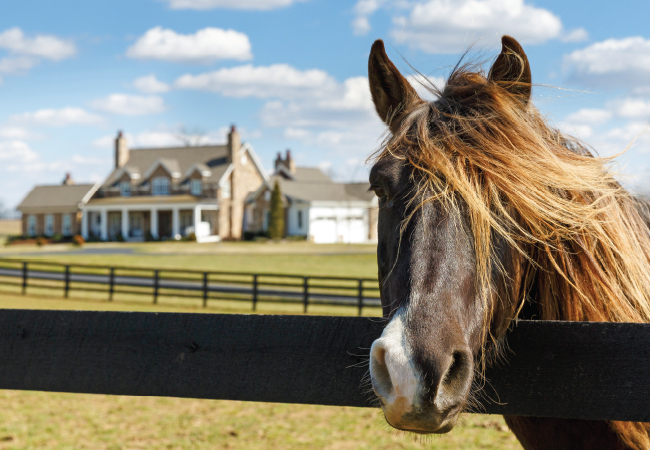 With its outdoor space complete with farm animals and pool to the thoughtful features inside and out, this is home is full of heart. It’s one of the questions those of us on the TOPS staff are most often asked: What color was the paint?